Earn up to 60 Vein Tap Points. Sometimes, there just aren’t enough footswitches on a pedal. This can be a pain even when you’re in your room practicing, having to bend over to mess with a pedal’s controls, let alone when you’re onstage, where making a performance look effortless can be the difference between impressing and really impressing your audience. What you need is a dual momentary footswitch. 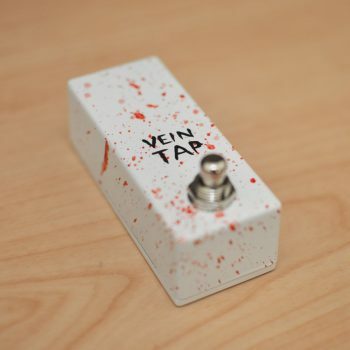 And so, we at Vein-Tap.com thought we’d help you out with the Skinny Little Twins. 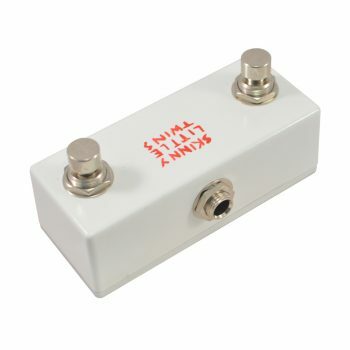 This great, compact twin footswitch plugs into amps, multi-effects units, and higher-end effects pedals like the Boss RC-series Loop Stations to give your feet greater control, freeing up your hands for playing, showing off, and casting shadow puppets whilst gigging (don’t do this; it impresses no one. 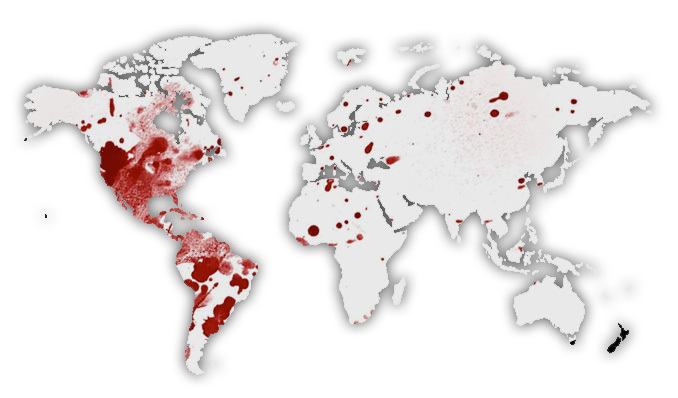 We checked). This dual footswitch can be used to select your amp program, change memory banks, stop and start looping playback and, of course, tap in the tempo. 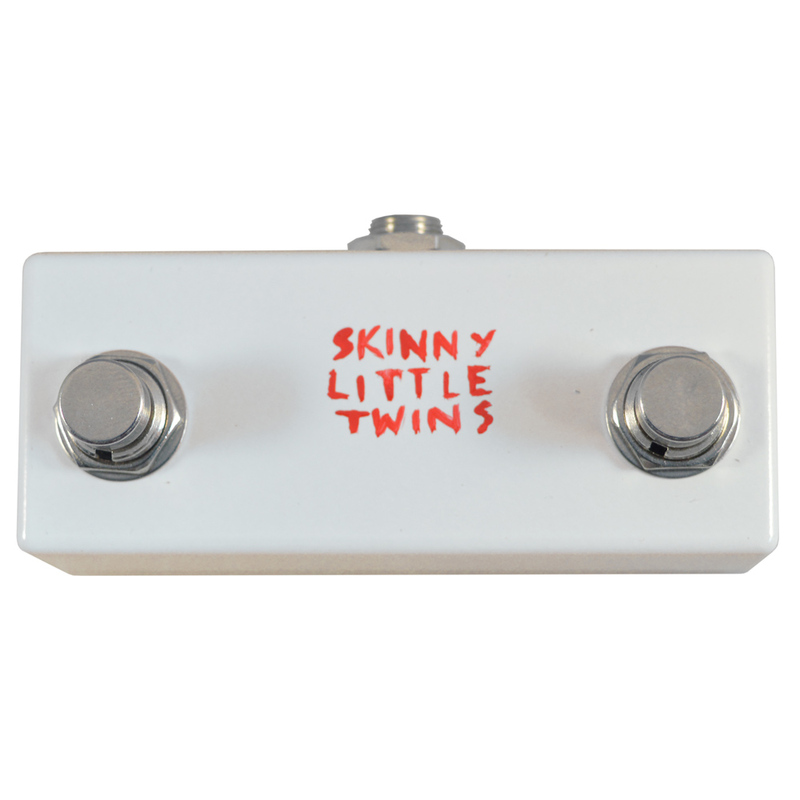 Simply connect your Skinny Little Twins using a stereo patch cable and see how much they can help you out! Have a cheeky watch of this video of us using the Skinny Little Twins with a Boss RC-30 Loop Station to see how handy they are. And it’s not just effects pedals. You can control amps galore – Roland’s CUBE XL series of guitar amps, for instance, all love having the Skinny Little Twins plugged into them to control their parameters. These footswitches use a stereo output, so make sure you’ve got a stereo patch cable to use it with, or only one of the Skinny Little Twins’ switches will work. If you’re a bit confused as to what’s going on, please use the Contact Us page and we’ll let you know exactly what it is you need. 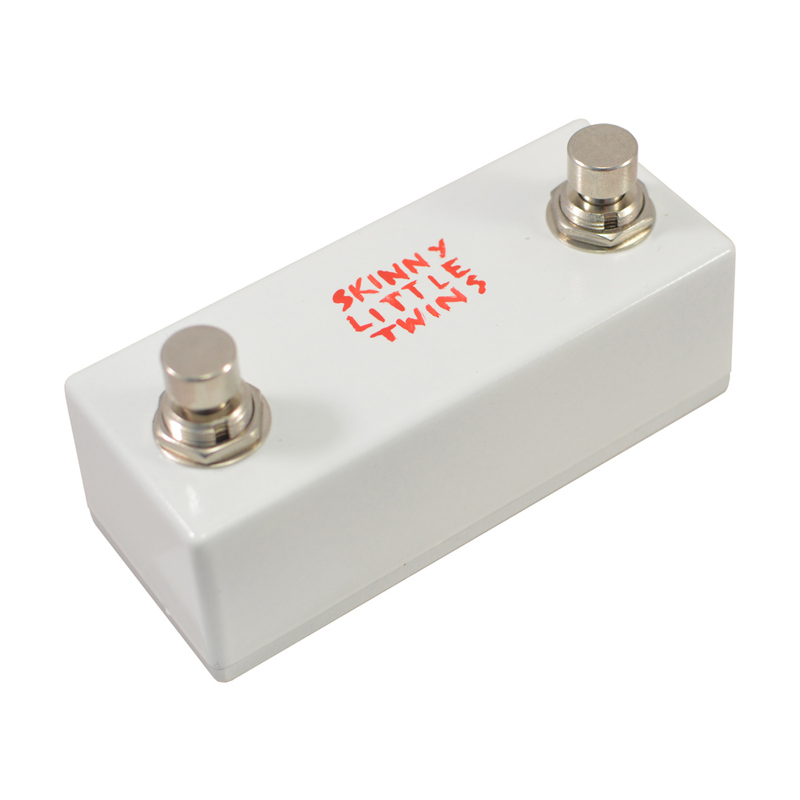 New for 2016 – we’ve updated the Skinny Little Twins so that now you have a choice of hard click and soft touch footswitches, each in either Normally Open or Normally Closed flavours. Normally Closed works with Boss and Roland gear, and Normally Open works with pretty much anything else – again, Contact Us if you’re confused as to which option you need. Buy a Skinny Little Twins now! It makes more sense than bacon! Very please with this solid little pedal. Great quality and half the price and size of it’s main competitor! I bought this to use with the Boss RC-3 but it’s also compatible with my Kemper so it’ll be utilised for that too!! Bonus. I use this pedal with my Axe-Fx II XL as a means of switching scenes up or down. This works really well, and as many of my presets are created per song, so I simply tap up through each scene as the song progresses. This saves a huge amount of tap-dancing and keeps thins accurate. I used to use the one with the latching switches but I recently replaced it with the soft switch version. This is much easier and more comfortable. It’s a very rugged, roadworthy pedal, and fits neatly on the corner of my pedal board, so it’s right where I need it. Perfect addition to my RC3. Functions as advertised, plus the soft touch is a really nice addition. Killer pedal and great customer service. I will definitely be ordering again! I bought a boss rc3 loop pedal, and quickly realised I would have problems double tapping to stop the thing, so I looked around and found the skinny twins foot switch. Problem solved, works a treat. Pretty well made and good value for money. This is a cracking quality option for those seeking a compact solution. I opted for the soft switches and I’m glad I did. It really makes a huge difference and I can’t see myself choosing the old type in the future. If you have a BOSS RC-3 and really want to keep things compact whilst making it easy and intuitive to use, then go for the Soft Touch Normally Closed box and pick up a half decent quality TRS short cable (I use Visiosound) and you’re set. Top level communication always helps so thanks Ben! Ordered one of these last year with soft switches to compliment my DD-500. Works really well and opens up the pedal to more control and options. Highly recommended. Perfect in every way! Makes using my RC-3 so much easier!! Thank you so much… great product and fast shipping! Just got one of these, I am very glad I discovered this pedal, perfect alternative to the Boss FS-6 which is just too bulky (and more expensive!) for my pedalboard. Now I have three control switches for my Boss GT-1 instead of the standard one which makes it much more usable in a live situation. Love the soft switches, also the size is just right, I can step on both switches at once easily if needed, but they are far enough apart that you won’t do that accidentally when you just want to press one. Great advice by email when I wasn’t sure which version would be compatible, I wish more companies were as quick and helpful. 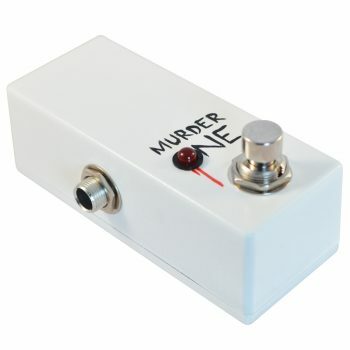 I’d highly recommend this pedal, it just does the job well, is well made and looks cool too! Bought to use instead of the Boss/Roland FS-6 with a Boss RC-3 Looper pedal (Normally closed and soft-touch). The soft touch switches are great, helping you to keep accurately in time. 2) Clear the current loop without partial playback of the loop (via press and hold). Switch 2 allows you to change preset. Of course, the FS-6 does this too, but it’s a lot bigger and twice the price. 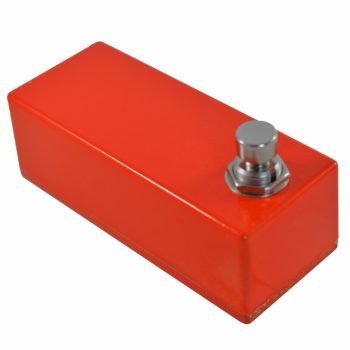 Now going to get another for a newly purchased Boss EV-8 pedal…. I have a skinny little twin and a vein-tap on my pedalboard. Both with soft, momentary normally open knobs. Smooth switching without a noise. For controlling functions of my Kemper profiling amp there is no better way. The Kemper remote is overdose for my needs. To big, heavy and to many unused functions. I testet it at home, in rehearsal and live. Only after live situations I know if something on my board really works out. And it does. Although the skinny little twins is so tiny the space between the knobs is enough to have controlled access without unintentionally pushing both knobs. Great! And I love the clear awesome look and painting. My board has to be reduced to the necessary functions. Nothing more. For me as a singer and guitarplayer I have to control my board within a microsecond or blind. The vein-tap switchers offer exactly this. And once again…the coolness factor of my pedealboard raised to the maximum. And as a gear nerd this is no naturalness because I am really picky. Very useful little pedal. Well built and good value for money. I just got my Skinny Little Twins in the mail today and I love it! I placed an order about a week and a half ago and Ben answered all of my questions via text/email within minutes and also shipped my pedal the same day. I’m using the Skinny Little Twins with the Boss RC-1 Loop Station. The manual for the RC-1 recommends the Boss FS-7 which costs $55 dollars and looks/feels sort of awkward next to all my boutique stomp boxes. I’m so glad I went with the Skinny Little Twins instead. This pedal cost about half as much and looks great! Although I ordered the “hard click/normally closed” options the switches are actually quite easy to press down. I love it! The Skinny Little Twins has transformed my RC-1 from a practice tool to a practical performance tool! Sweet! The pedal is well built and works perfectly. Very impressed with the service from Vein-Tap – good communication and quick delivery. 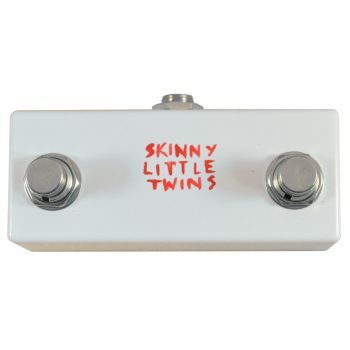 I have been using the skinny little twins with my Boss RC3 Looper pedal. I can now control stop playback/recording, tap tempo and scrolling up and down the patch banks, it’s the perfect compliment to this pedal. It even works on my ME-70 unit on both reverb and pre amp functions. 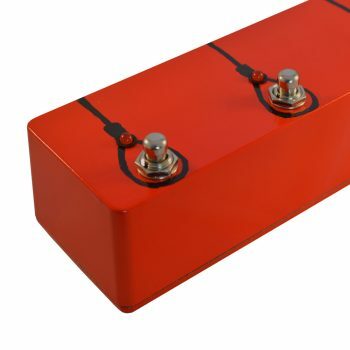 At half the price of a Boss foot switch with no loss in performance – it is an awesome piece of kit. Small, compact, well built like a Russian T58 Tank it is made to last. It arrived promptly, well packed and worked straight out of the box. In short; it’s performance is excellent, aesthetically pleasing, space minimising and passive so no power supply needed – it even smells good! I bet it even tastes good too (no, I’m kidding!) Just make sure you have a stereo patch lead to get full functionality from both switches. 5 STARS ! Looks great, very well built and arrived swiftly. Bought to use with my Boss RC-3 and it works a treat. Great price too. Amazing little pedal! Use it with my Boss RC-3 looper. Great for stopping the looper without double tapping + switch between loops. Also tried it on my Zoom G2.1u and new possibilities opened up. Great to start/stop the drum machine whithout fiddling with a little knob. The G2.1u can be programmed for different uses of this extra controller. My only complaint is that the buttons where hard to push down. Will hopefully be smoother after some use. Great service – delivered quickly and my questions answered in no time. Buy one if you have the RC-2 or RC-3. Love it! I’m using it with my RC-3 Looper. Just great! Solid and looks clean. The service of Vein-tap is great too. They contact me because of a mistake I made with my order. Thanks again! Fantastic pedal. Very well made and have no worries stomping on this regularly. Works perfectly with my rc-2. Great company, great pedal, great service. I love it already. Using it with a Boss RC-3 Loop station. Very well made and solid. Small footprint and no batteries to ever worry about. Very fast delivery, only ordered it yesterday morning. Has made my looping life so much easier. Very happy and will certainly be telling my friends about it. I would recommend it very highly. I received my Skinny Little Twins – Dual Momentary Footswitch and it’s super cool. Small footprint, well built and durable. Using it with the Beat Buddy and it works a treat. Great pedal. So good I got a second one. I am using it with a Roland Cube and works a charm. Sturdy and stylish. Excellent product, I’m using it with my Boss GT100. A lot cheaper in price and smaller than the Boss equivalent. The pedal itself however is not in any way cheap. It is robust and reliable… Loving it! 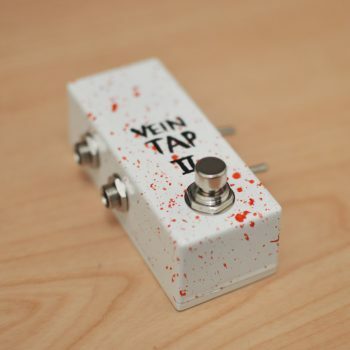 Thank you Vein-Tap! I was looking for an alternative to using two Boss FS-5U momentary switches with my Roland TD-8 electric drum kit; the Skinny Little Twins fulfill the two-switch functionality perfectly, allowing me to toggle rhythm patterns or kits or perform sequencer operations with my feet without having to stop drumming… as an example, this means I can play bass guitar whilst switching song parts with my feet, or I can change drum-sets whilst playing to expand the range of sounds available to me – brilliant! For anyone else looking to use the SLT in the same way, I found that the TD-8 ‘reads’ the left pedal as ‘switch 2’ and the right as ‘switch 1’ in terms of the stereo ‘channels’ but as the TD-8 allows each pedal function to be assigned manually, that doesn’t matter in the slightest. Excellent product, very good value and working well so far! Fantastic companion for my Boss RC-3, although it would be good to provide a 1/4″ TRS cable as part of the package. Bought it to control a Boss DR 770 drum machine. Drum machine and switch both have a stereo jack so 1 stereo cable is all that’s needed. Alternatives involved 2 single switches or a double switch with 2 outputs still needing a splitter, so they would have been bulky and expensive in comparison. Skinny Little Twin is small light robust and perfectly functional. Also very visible with its white paint. I love it, as much as anyone can love a switch. Does exactly what is says it does ! Using with RC-3 and I wish I had met my Skinny Little Twins earlier. No more missing cues using a double tap on the RC-3 or breaking my back to select another loop. Highly recommended, great value, built like a tank & looks great ! Tiny, built like a tank and no batteries required. Momentary switches so it works flawlessly with the Kemper Profiling Amp for rig changing (Go into “System” scroll to page 8 > set pedal to “Switch (Stereo)” and you’re good to go. Lifetime guarantee. Absolutely worth every penny. Thanks Vein-Tap. This tiny dual switch works perfect with my Boss RC-3. Tap a loop before playing, one click loop stop, skip through the presets, all with this little switch. Just great! Good price, high quality. yes, it’s arrived today and everything goes fine! So, I’ve saved space on my DIY pedalboard! 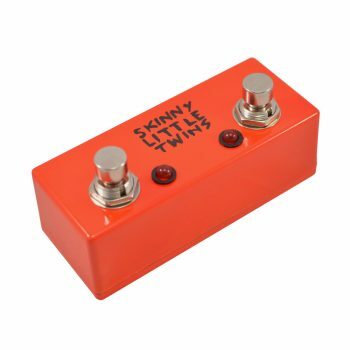 Needed a replacement for my H&K amp’s dual footswitch and the Skinny Little Twins pedal looked perfect for the job. The momentary switches were kindly swapped out for latching at no extra cost and it looks great on my board. Can’t fault service or pedal quality, top stuff. Great product at affordable price, this compact switch fits perfectly on my pedal board and is the perfect partner to my Boss Rc-3. Customer service was equally good, quick and helpful. Does what it says it does, which is also what I want it to do. Stylish, well built, cute, all at a reasonable cost. Nice one, guys, and thank you. Great pedal indeed. It makes using loop pedals much easier, gives you more hands-free capability. It’s very compact so it can fit in any pedalboard. It’s also much cheaper than its competitors. Very recommended. Fantastic pedal! Well made, quickly dispatched and I got great advice on compatibility by e-mail too. I’m using this with Stealthpedal/Amplitube and it’s definitely made my setup awesomer!